Peresus and La Hiedra, children of Sangre Chicana and local regulars, were added to the match. 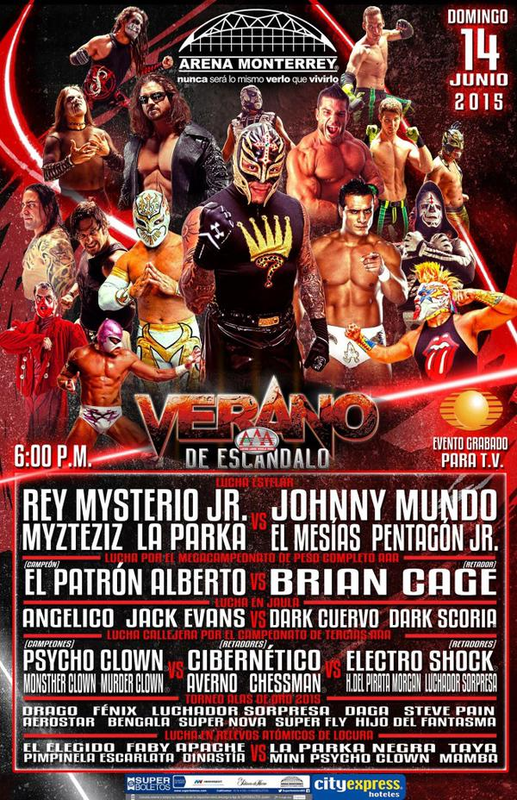 Laredo's return to AAA, though his first televised appearance would take place at Verano de Escandalo (out of order.) La Secta challenged Angelico & Jack to make the Verano de Escandalo cage match a hair match. Gueros del Cielo accepted. Cibernetico appeared after the match to declare it would be his team - not Psycho Circus or Holocausto - to win the trios titles. La Sociedad helped Cage beat Alberto, who left bloody. Machine Rocker replaced Parka Negra and now has a white fright wig on top of his mask. Dinastia and Mini Psycho Clown fought a lot (and well) leading into their title match. Rudos surprising won with Machine Rocker submitted Elegido to a crab as Mamba also submitted Faby. 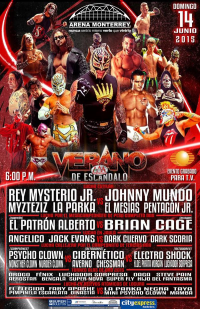 Laredo Kid was the surprise luchador (announced in the match graphic.) Steve Pain also returned (again) to AAA. A nearly non stop high spots match that start with four dives at the same time and hardly slowed down there. There was no specific story to the match, just big spots. Fenix suffered a shoulder injury taking a suplex out of the ring (hitting the apron on the way down - the spot either went wrong or was a really bad idea), tried to continue, and collapsed in pain after a top rope double stomp. He was stretchered out, crying in pain. Match was derailed a little bit while Fenix was taken away, but picked up speed again near the finish. Drago beat Aerostar with his flipping DDT and Dragon's Tail cradle, similar to the finish of their Best of Five series. Drago was given a giant golden wings trophy. Rules were the first team out would escape, and the entire losing team would lose all their hair. Everyone bled in a bit more of a brawl than the usual Angelico/Jack match. A very good match, second match on the show. Jack had chances to escape, but appeared not to want to leave Angelico behind. All four fought on the top of the cage at the end, two on opposite sides of the ring. Scoria was fouled and crotched on top of the cage by Angelico, and Cuervo was shoved off and fell thru two tables (though mostly just cracked his head on one - both he and Scoria had bad looking head impacts during the match.) Cuervo & Scoria got most of their hair cut off in the ring, then asked for handshakes. Angelico & Jack accepted, and La Secta turned on them and left. (They appeared to get the rest cut off in the back.) Angelico & Jack won a match with a lots of big spots. Both Cuervo & Scoria lost their hair. Blue Demon Jr. and Texano Jr. were seconds and Tirantes was referee. Match very quickly turned into the rudos (Tirantes included) trying to cheat the title away from Alberto and failing repeatedly. Demon was ejected a few minutes in for counting Texano's interference. Tirantes would fast count for Cage and refuse to count for Alberto. Texano eventually summon Pentagon & Fantasma for support, and they were both thrashed by Alberto. Alberto finally took out Tirantes with his head kick and put Cage in the armbar, who tapped with no referee. Cage escaped, give Alberto a foul and F5'ed him on the belt. Piero, who had turned up on stage too soon and tried to turn invisible, then ran down to make the count and did count 3 for Cage. He immediately signaled a DQ win for Alberto. Rudos stomped Alberto and buried him under an American flag. In a post show interview with the media, Alberto claimed he told AAA he wanted a cage match with hair on the line with Brian Cage, or he'd quit the company. Rey entered with a Terminator and had a Terminator themed outcome. A lot of La Parka comedy (including some well timed stuff when a spot got botched.) Myzteziz suffered a right leg injury but finished the match. Rey Mysterio Jr. won with a leaping off the middle rope Canadian Destroyer on Pentagon Jr. Mundo and Mysterio had a very brief staredown post match. Psycho Clown introduced Goya Kong, his sister, as the newest member of AAA and the mystery luchadora in this match. Suicide beat Machine. Villano IV interrupted the celebration to declare his family was better than the Alvarado family. 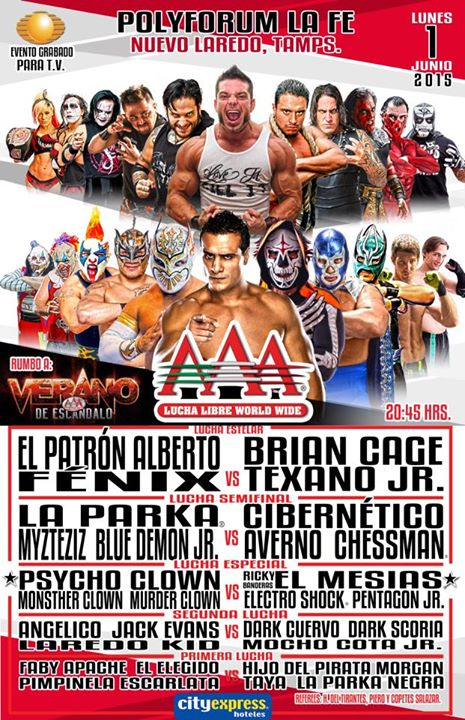 Aerostar replaced Argenis on 06/17. Super Fly beat Aerostar with a double powerbomb. Dinastia's sixth defense (fourth official, two off TV) was said to be a techinical match. Dinastia won with the Tulancingo Special. Drago & Joe Lider replaced Fenix & Pentagon Jr. on 06/17. La Secta got a revenge win. Tables were used. 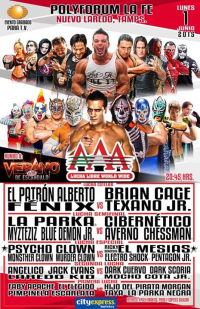 Originally a Holocausto vs Psycho Circus trios match, Chessman added to the show and Averno moved down a match on 06/17. Electroshock & Pirata beat Monster for the win. Rey Mysterio took the place of a surprise wrestler. 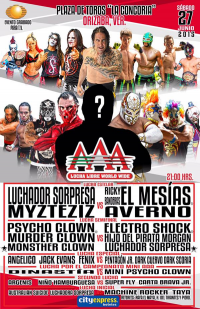 Psycho Clown was moved up from the semifinal to replace Myzteziz and Texano Jr. replaced Averno. 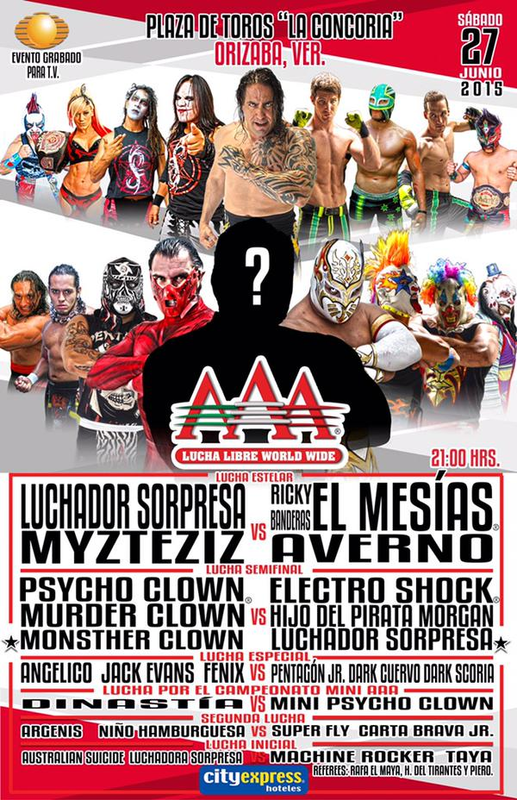 Fantasma replaced Texano, who had an arm injury and blamed it on Psycho Clown. Rey beat Mesias, has not lost since returning. Event Notes: Card was originally set 06/27. Lineup was first found on 06/04, and changed on 06/17.